John Valerio Latin Jazz Piano PDF + Mp3 CD download. Learn how to play Latin jazz Piano based on traditional Latin music from Cuba and Brazil. Latin Jazz Piano addresses the three roles that the jazz pianist typically plays: as a member of an accompanying rhythm section, as a lead instrument within an ensemble and as a solo instrument. The CD features many examples in the book and combo tracks with which to play along. The book is divided into three sections. The first covers Afro-Cuban (Afro-Caribbean) jazz, the second section deals with Brazilian influenced jazz – Bossa Nova and Samba, and the third contains lead sheets of the tunes and instructions for the play-along CD. The Afro-Cuban section contains a chapter on some basic concepts of traditional Afro-Cuban music, including the clave, tumbao, and montuno. Also, there is a chapter on typical piano voicing used in Afro-Cuban music Latin jazz in general. Next is a chapter on typical comping patterns used in various Afro-Cuban styles such as Mambo, Cha-cha, etc. The last chapter in this section features tunes written in these various styles and arranged for lead instrument, piano and bass, piano lead, and piano solo. The next section on Brazilian-related jazz begins with a chapter on the many varied rhythms typically used in comping for Bossa Novas and Sambas, and concludes with a chapter featuring tunes arranged in the same ways as the first section. The third section contains lead sheets of all the tunes so the reader can play and improvise on them along with the accompanying CD. The reader is encouraged to continually change the way he or she plays these tunes and apply the principles found in this book to other tunes in the Latin jazz repertoire. 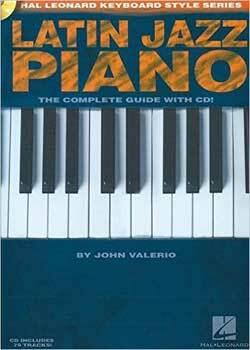 Download John Valerio – Latin Jazz Piano PDF free and other books from our site. Only high quality PDF scans. Please write a review, it's important for our community.